Villa 040 is the perfect villa for a young family, as the pool area is separately fenced off from the garden area, so children can run around freely without fear of falling into the water. It is located in a quiet cul-de-sac and has a mature garden with large green plants, shrubs and conifer trees. Off-road parking is also provided. The kitchen benefits from large patio doors, with curtains, and is fully equipped with an electric oven and hob, microwave, fridge freezer and washing machine. A window, with blind, above the double sink looks out over the back garden. The property also has a downstairs w/c with window. Go through the patio doors and find yourself on a patio covered by a wooden pergola. A glass topped dining table and 6 chairs make eating al fresco a delight, especially when it has been cooked on the BBQ. The large garden area is completely fenced in, making this a safe property for young children. Decorative paving runs amongst the astro turf and chunky palm trees, very tall conifers and shrubs add to the feeling of privacy and seclusion. At the end of the garden is a fenced pool area with 6 sun beds and surrounded on one side by shrubs. Parasol with base, side table and outdoor lighting are also provided. Go up the stairs to the first floor and the window, with curtains, offers you beautiful views of the garden and pool area. Off the landing there are 3 bedrooms, 2 doubles and 1 twin and a large family bathroom, which has shower over bath, a black unit and under sink storage for all your toiletries. The first double bedroom and twin room, both have views of the pool. The master double room has a divan bed and windows with a blind. Patio doors, with black out curtains, lead out onto a private balcony. Bedside cabinets with lamps, dark wood wardrobes, full-length mirror and a dressing table, tick all the requirements of a bedroom. The second double bedroom is located at the front of the property and has patio doors, with curtain, which lead onto a second private balcony. It also has windows and a blind, bedside cabinets and lamps and fitted dark wood wardrobes. The twin room has divan beds, bedside cabinets with lamps, fitted wardrobes and windows with a blind. 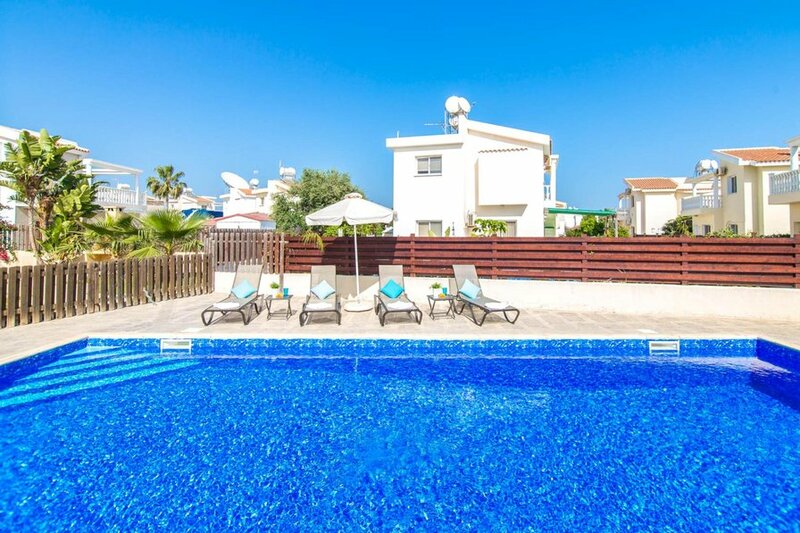 A lovely family friendly villa.